Can’t stop wearing this mark. Call It A Tie Blouse!! Last time you saw it I paired it with shorts & since the weather has changed a bit since then I paired it with a skirt & blazer this time around! I was super inspired by this photo of Olivia Palermo on Pinterest…she is hands down my style crush, I don’t know why I haven’t created a whole board dedicated to her outfits & hairstyles yet, she can pretty much do no wrong! Who is your style crush? Gorgeous outfit Jacquelyn! That top is beautiful. Love your bag and the jacket. 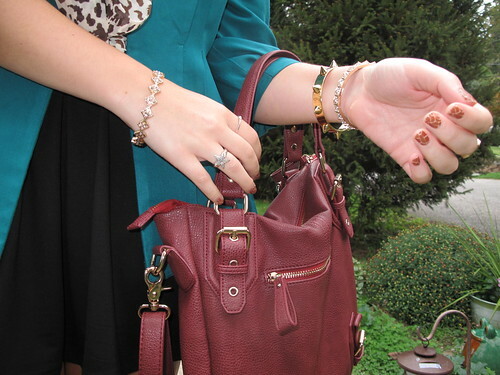 Love the color of the blazer with the bordeaux tote! Bordeaux is my favorite color for fall.. along with the rest of the wolrd, ha! Wonderful outfit!I love the blazer you wore over the top! Great pops of color! absolutely love this outfit, you look great!! Love the look! 🙂 Your top is awesome. Wanna follow each other? Wow! You are looking so lovely. I love your skirt.